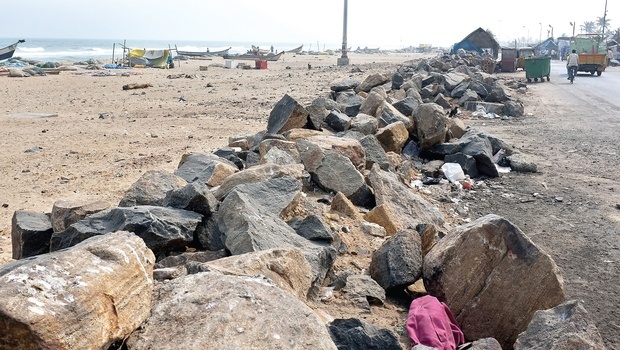 CHENNAI: With 14 acres of beach space lost to ill-planned beach beautification projects and construction of illegal roads, the Chennai Corporation is the biggest violator of Coastal Regulation Zone (CRZ) Notification, according to a report released by the Coastal Resource Centre. Activists slammed the civic body for the blatant disregard of rules in pressing ahead with coastline projects without even receiving clearance from the State Coastal Zone Management Authority (SCZMA). Activists said that the report’s release was necessitated as the Corporation was set to table requests to the SCZMA seeking clearance for two beach beautification projects worth `100 crore, including the Marina Loop Road project, in three days’ time. The report noted 20 violations by the Corporation on the beach space from the Cooum mouth near the Marina up to Neelankarai. Fifteen of these violations involve dumping of construction debris, or using debris to construct illegal roads and other structures on the beach. “The Corporation was asked by the SCZMA to file a report on the violations on the coastline. But, the Corporation is the biggest violator, looking at these findings,” said K Saravanan, a fisherman from Urur Kuppam, who was part of the study. When asked if a case has been made to the Ripon Building officials, activists said that many of the violations happen without the knowledge of Corporation Commissioner Vikram Kapur. “We made a case against setting up of benches on Neelankarai beach and the Commissioner immediately acted upon it. However, local councillors and the contractor lobby are also summarily responsible,” said Nityanand Jayaraman, advisor to Coastal Resource Centre. However, the regulatory body also came in for criticism with the report coordinators stating that the agency only seemed inclined to grant clearance to the Corporation’s project. “The SCZMA is a toothless body. The officials are pressurised to grant clearance for the beautification projects which have dangerous ramifications. These projects not only endanger Olive Ridley breeding on the coastline, but also the livelihood of fishermen,” said Jayaraman. “Post-facto rectification of a problem is not possible. The Corporation is seeking clearance from the SCZMA for a project that has already been started,” said Jayaraman, referring to the Marina Loop Road beautification project. However, speaking to City Express, Corporation officials suggested that the civic body was working to clamp down on violations, contrary to what is suggested in the report. “The Corporation is fully committed to upholding CRZ norms. This is the reason why we have not proceeded with the improvement of Marina Loop road, and are instead waiting till the SCZMA approves it,” said a senior official. “Most of the cases listed in the report are fairly old ones. These will be looked into promptly,” the official added, referring to the 20 violations noted in the report. Read the Original Article in the New Indian Express.